Long time coming... Pictures at the bottom of the post. Inspired by Cat Stevens's recordings and live performances, I had been actively looking for a preowned Gibson J-180 (Lefty) for over three years, but neither the secondary market nor inquiring with major retailers for a brand-new guitar yielded any results. Until that fateful day I heard of a retailer specializing in custom orders including Gibson with their Made 2 Measurement program—success! Around the time Gibson filed for chapter 11 insolvency protection, I decided to put my money where my mouth is and order a Gibson J-180 (Left Handed) from the Custom Shop at Bozeman, Montana. The order was placed through Gibson's own Made 2 Measurement program with my German dealer Musikhaus Hermann OHG (whom I can wholeheartedly recommend) on June 14, 2018. And, CITES notwithstanding, I got my hands on the guitar in Berlin, Germany, on this 12th day of January, 2019. 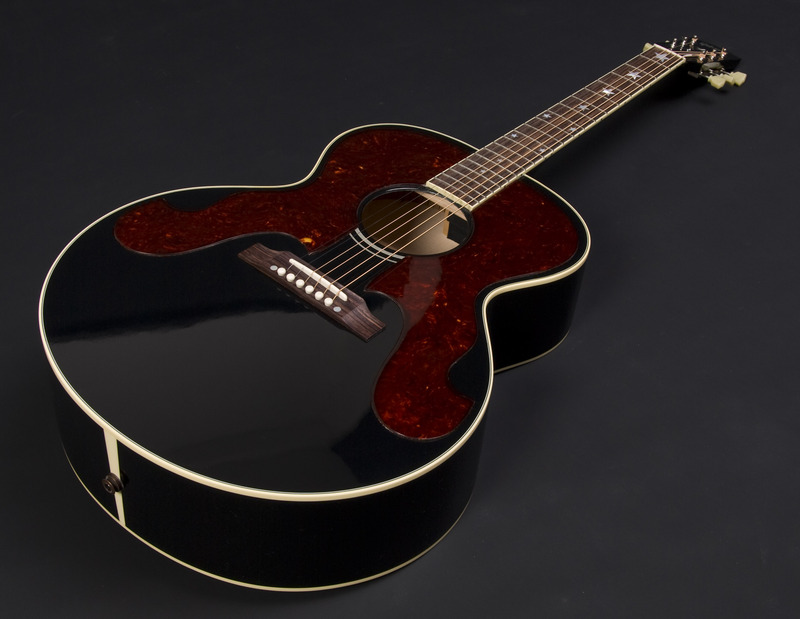 The Gibson Everly Brothers guitar (in 1986 and once again in 1996 reissued by Gibson as the J-180 with different specs) is a stage and recording guitar mainly for singer/songwriters. 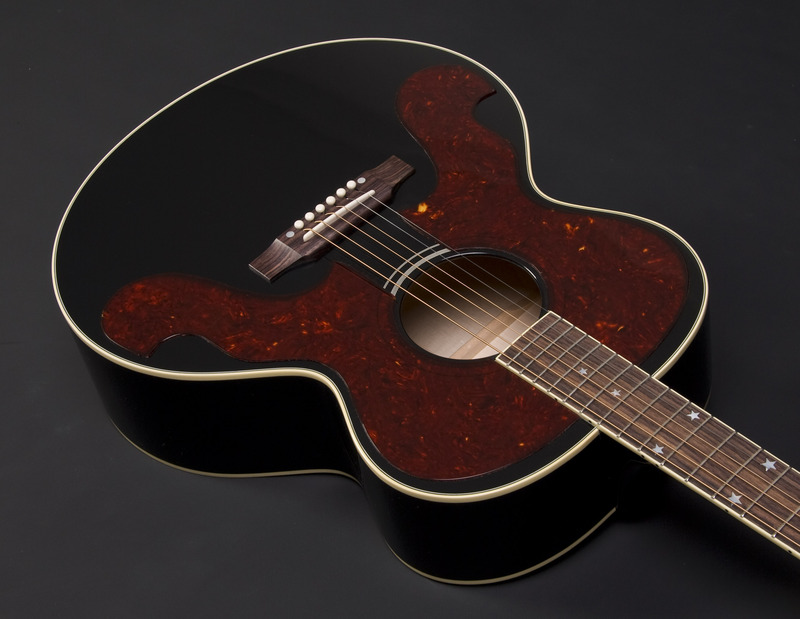 During the 1950s the Everly Brothers played J-200 models with two large white pickguards on either side of the soundhole because of their heavy upstroke when strumming quickly which would eat through any soundboard. 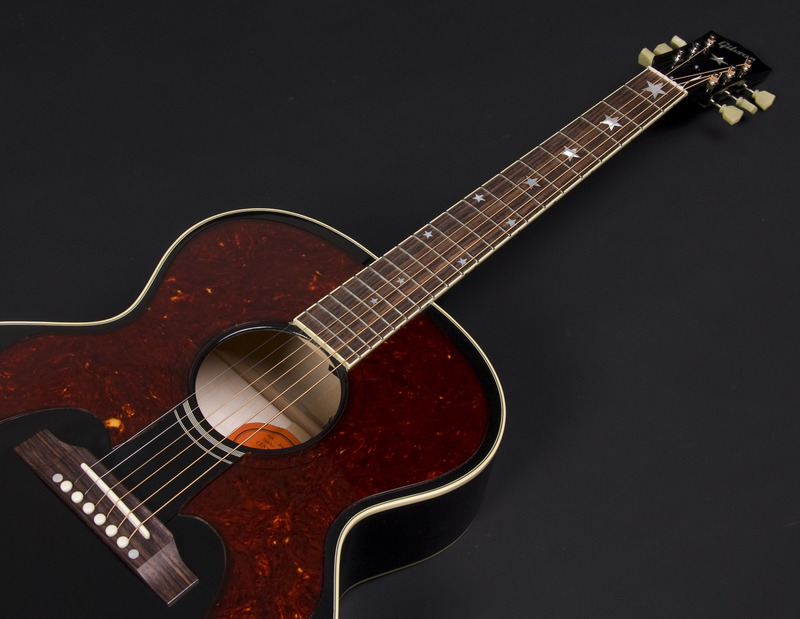 The Everly Brothers model was introduced in 1962 with tortoise colored pickguards. 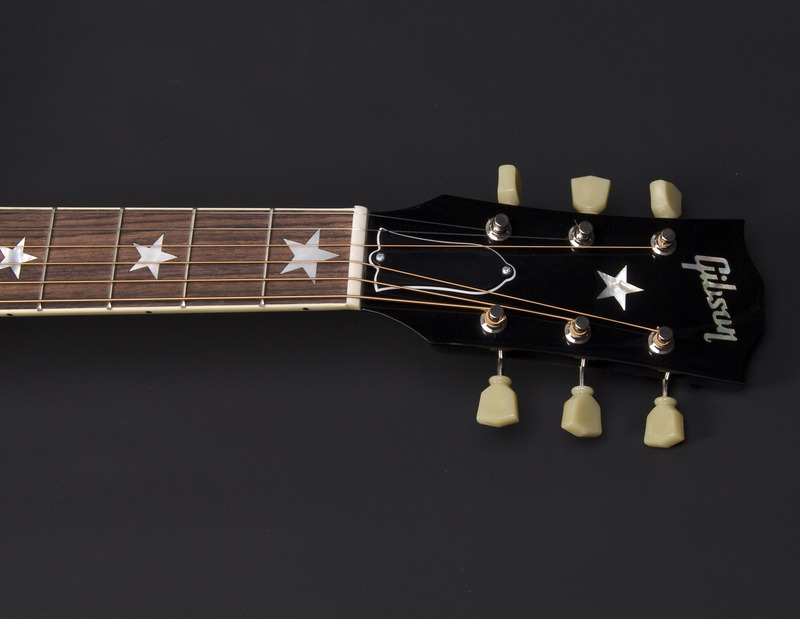 It was conceived as a striking stage guitar that geled well with the Everly brothers who required a classic-looking, comfortable, compact rhythm guitar that would not interfere with their tuxedo look, their singing, and with how closely they stood together on stage playing and singing into a single mic. Under the bottom line, the J-180 is but a funkier J-185, which in itself, generally speaking, is a more compact, more affordable SJ-200 (sans the maple neck). Warm and mellow, yet clear and articulate. Lots of low end, yet bell-like highs. Tactile and responsive but with quick decay. Strong string separation. Great dynamic range in terms of volume and responsiveness. Great for fingerstyle and rhythm. Due to its compact size she's very comfortable to play in whatever position you're in, whether you're standing or sitting at your desk with your feet up on the table. The neck is very comfy; it fills my hand pocket nicely. In the higher registers she plays nice as well and allows full-note bending. The (narrow) frets are well plekked. And the mesmerizing smell of new nitro-finished Gibson—there's nothing quite like it! Impeccable finish, no buildup. The interior is super clean—no glue lines or spills. The neck is straight and not twisted and correctly centered. The pickguards are firmly attached. The LR Baggs pickup elements are neatly tucked away and out of sight. The frets are nicely plekked. However, I don't like how the nut is plekked not because of the depth of the nut slot (they are perfect) but how steep and not rounded off they were cut. This causes the string to catch on the nut slot and causes difficulties for the tuning keys. I will have to further lubricate and round off those slots (with some old strings of the same gauge). In hindsight I wish I had ordered in time locking tuners or those vintage Kluson Wafflebacks. Spot on. The string action at the 12th fret is 5/64th (bass) and a little under 3/64 (treble). The nut action is fine. The saddle could sit a little tighter within the bridge slot. I only had to tighten the truss rod a little to straighten out the neck leaving the slightest bit of relief. I strung her up with brand-new light Gibson J-200 phosphor bronze strings. Damn - did you have to give Gibson a spare kidney? That is truly a beautiful guitar. The background and history lesson were a big plus. Actually, she was reasonably priced. Wow .Wish I could strum that beast! With the Tulips it looks just like the Billie Joe Armstrong sig. 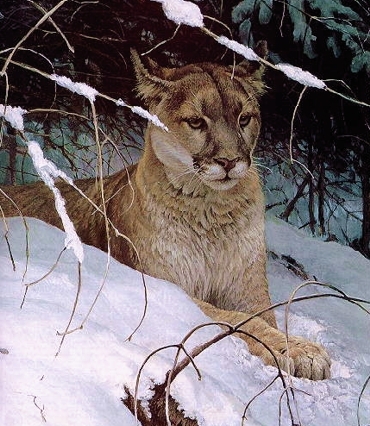 I’d like to order one with the pinless bridge .But I think Bozeman only does those for the japanese market. They'll probably do it. That's what the M2M program is for. Very nice looking instrument, sir! And apparently well worth the wait to land it. I think the only guitar that would tempt me these days is a 180-185 body, maple or mahogany. 200s are quite nice but a bit on the large side and long scale, neither of which appeals to me. New wood in the house! Wow! That's fantastic! Major congrats! Did you ask for it to be drilled for a strap button? I think most 2018 models came that way. Nope, it's got no strap button at the heel. I'll go via the headstock with a leather extension just like Cat Stevens did (even though structurally it's not in the guitar's best interest but I'll watch out). Just curious...What model is typed on the label? And, is there any sort of custom shop decal on the back of the headstock? 2nd edit: After reading your post I saw: "Model name: J-180 (Custom Shop)". I guess that's what's on the label. Cat’s Everly looks to be in good shape still. I’m sure your J 180 will due just fine. So beautiful...thrilled that the story ended so well!! Worth the wait methinks. My J180 has grown on me more than any guitar I've ever owned, I liked it originally but LOVE it now. Ditched the undersaddle pickup and went with a soundhole pickup which made it even better. Glorious guitars and so iconic! Leonard, that is a stunning guitar, congrats! Wow what a great looking J180 Mr. McCoy! After the long wait I am glad it didn't disappoint. It must be a great feeling to finally have it in your hands. Patience rewarded! !